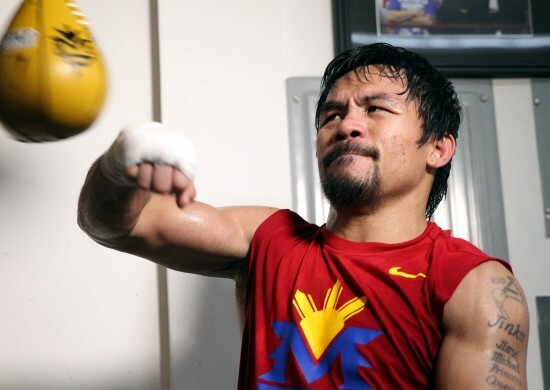 Photo of the Day: PacMan in Hard Training for Mayweather Showdown! Photo by Chris Farina – Top Rank, Copyright 2015. HOLLYWOOD, CA, March 28, 2015 — Superstar Manny Pacquiao trains with Hall of Fame trainer Freddie Roach at the Wild Card Boxing Club for his upcoming 12-round welterweight world championship unification mega-fight against Floyd Mayweather. Promoted by Mayweather Promotions and Top Rank Inc. , this pay-per-view telecast will be co-produced and co-distributed by HBO Pay-Per-View® and SHOWTIME PPV® Saturday, May 2 beginning at 9:00 p.m. ET/ 6:00 p.m. PT from the MGM Grand Garden Arena in Las Vegas. Floyd Mayweather and Manny Pacquiao Come Face to Face to Officially Announce Their May 2 Superfight! 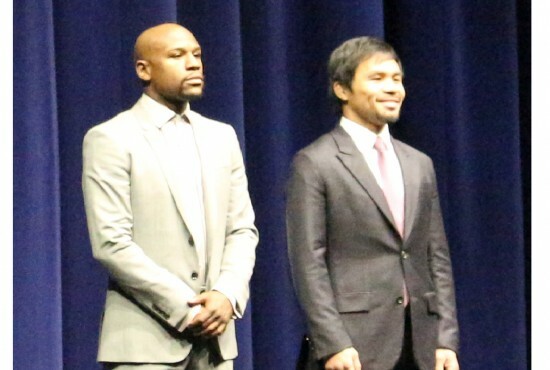 Floyd Mayweather and Manny Pacquiao stand side by side for the first time. LOS ANGELES, CA, March, 12, 2015 — On an unusually cloudy Wednesday afternoon in Downtown Los Angeles, boxing’s two biggest stars converged on the Nokia Theater in the sole press conference to promote their imminent collision at the MGM Grand on May 2nd. This was the only chance the media would have to see the two fighters face to face before they climb into the ring together and the media responded in full force literally bringing out the red carpet treatment. There were also thousands of fans lining the streets and courtyard surrounding the arena hoping to catch a glimpse of their heroes with many waiting for hours just to get a good spot. It seems fitting that a fight that has been 5 long years in the making and being dubbed by many as “The Fight of the Century” would create an event of this magnitude where most boxing press conferences might draw 20 or so reporters this one had a staggering media attendance of 700! Swanson Communications Launches New Look Website Streaming Mayweather-Pacquiao Press Conference Today! BROOKLYN, March 11, 2015 — Swanson Communications is pleased to launch a newly redesigned website by hosting the live stream for the Floyd Mayweather vs. Manny Pacquiao official press conference today in Los Angeles at 4:30 p.m. ET/1:30 p.m. PT. 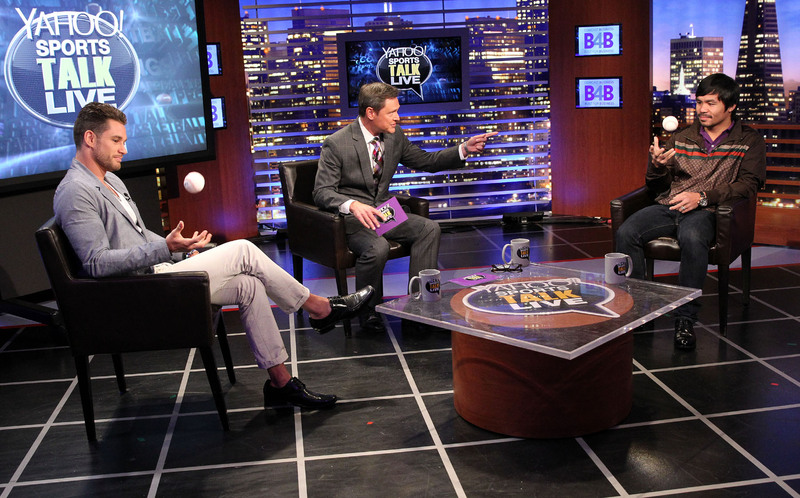 SAN FRANCISCO, August 28, 2014 — Superstar Manny Pacquiao(R) and New York’s undefeated (20-0) WBO Jr. Welterweight champion Chris Algieri(L) make a special appearance on “Yahoo Sports Talk Live” with host Jim Kozimor(ctr) at Comcast SportsNet Bay Area , Thursday on ‘Day Four’ of their worldwide tour. 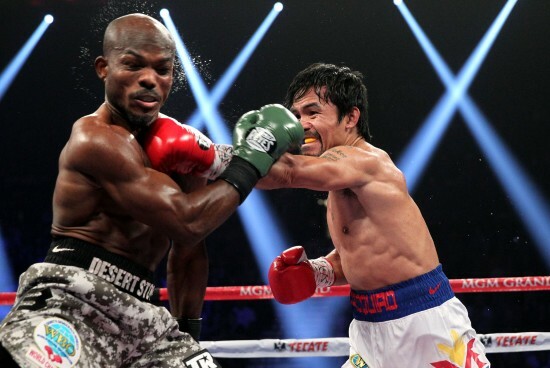 LAS VEGAS, April 12, 2014 — Manny Pacquiao wins a 12-round unanimous decision over Timothy Bradley to earn the WBO World Welterweight belt , Saturday, April 12 at the MGM Grand Garden Arena in Las Vegas, Nevada.